The greenhouse window behind our kitchen sink used to have shelves in it. I’d start seedlings and transplants there, and left the space under the shelf free for the cats to sun themselves. Then I needed to move my jade plant to a new location, as it had completely outgrown its prior space, so we took out the shelves to make room. 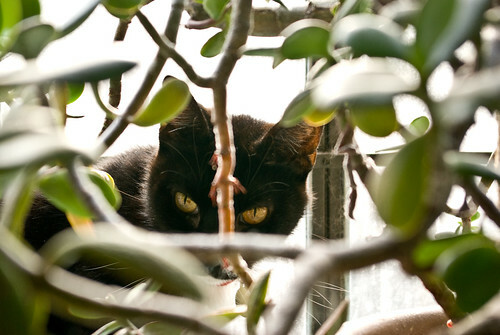 The cats still sun themselves in the space, but now they can pretend to be fierce jungle panthers peering through the foliage. I think they like it.